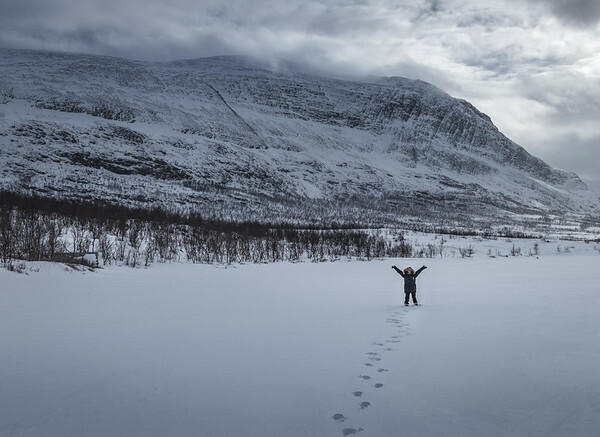 Our first day in Abisko. Decided to go for a wander and came across this jewel. 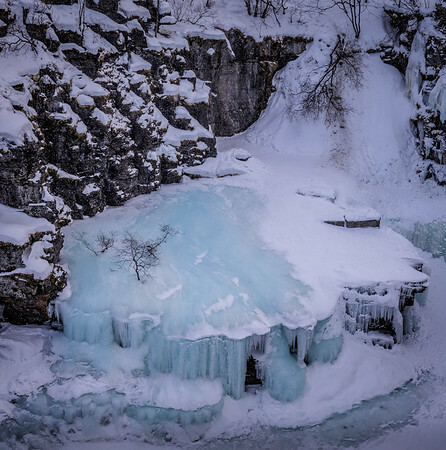 A frozen waterfall with a weathered tree in the centre as if frozen in time waiting for the arrival of spring. A shot from our Husky sledge. 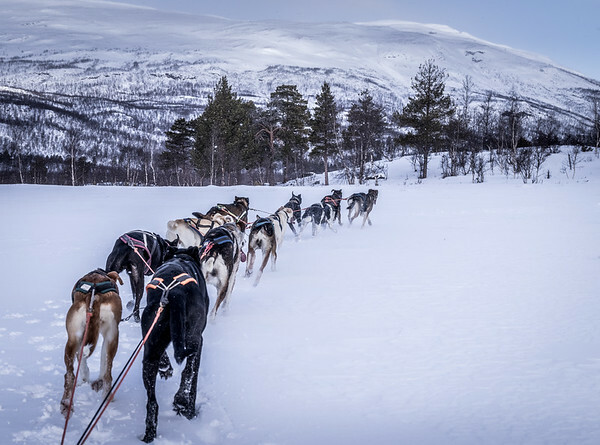 Few things come close to being pulled on a sledge by enthusiastic huskies through the Swedish Lapland. Beautiful landscape and friendly dogs, what more could you ask for? I wish my dogs were half as trained as them. The three days we were in Abisko, it was pretty much overcast the entire time. We decided to take a stroll and find a clear place to fly the drone. after getting some footage, just as we were returning for dinner a small opening appeared in the clouds and the setting sun cast an orange glow on the mountains in the background. The trees in the FG are dark and in shadow while the background is on fire adding a lot of contrast to the scene. 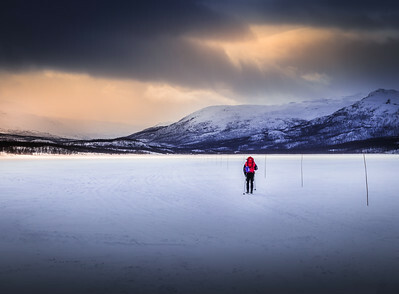 A lone hiker embracing the snowy wilderness of Abisko National Park. 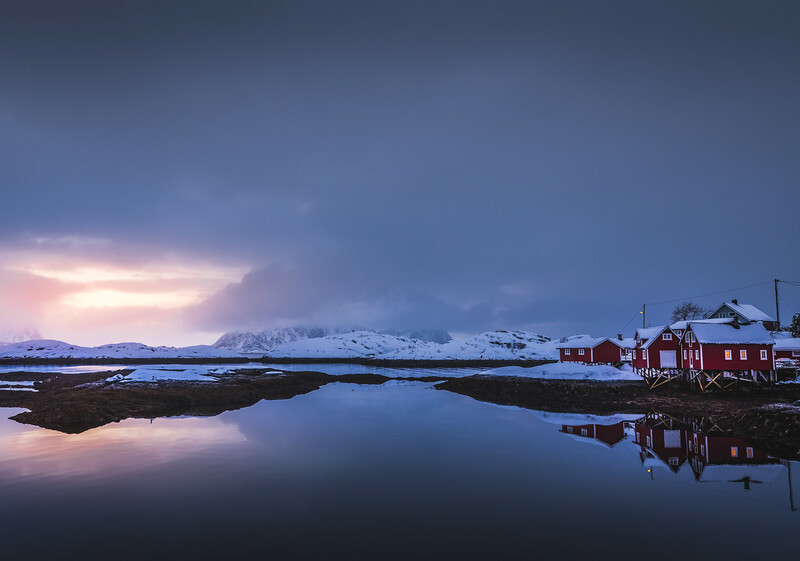 His bright red backpack stands out in an otherwise monochromatic environment and adds striking contrast to the image while the winter arctic sun bestows a warm orange glow upon the misty and snowy background. The bag is what caught my eye and I decided to include the hiker in my shot. @instasurs in one of her classical yoga poses. As the sun went down and it started snowing, the landscape lost all colour. So, we decided to add our own colour. One of the best rides of our life. 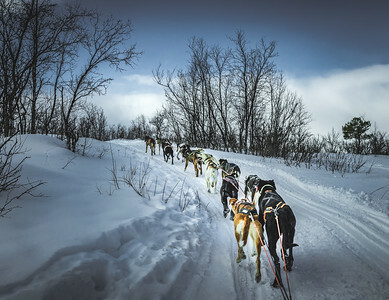 Speeding through snow covered Abisko National park, driven totally by 'Dog Power'. These little guys are so amazing - enthusiastic about pulling the sledge, so playful, yet so obedient when it comes to listening to their trainer. A true bond of love and respect exists between them and their human. 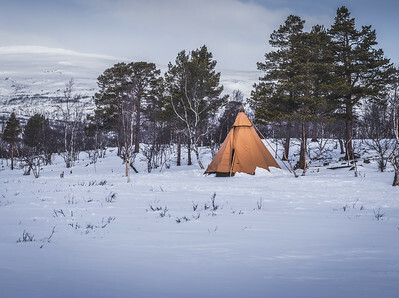 We stopped at this Teepee during our husky sledding trip. A welcome break from the freezing temperature. It was nice and surprisingly quite warm inside with a nice fire going to make coffee and heat some awesome cinnamon rolls. A true Laplandish experience in the middle of wilderness. 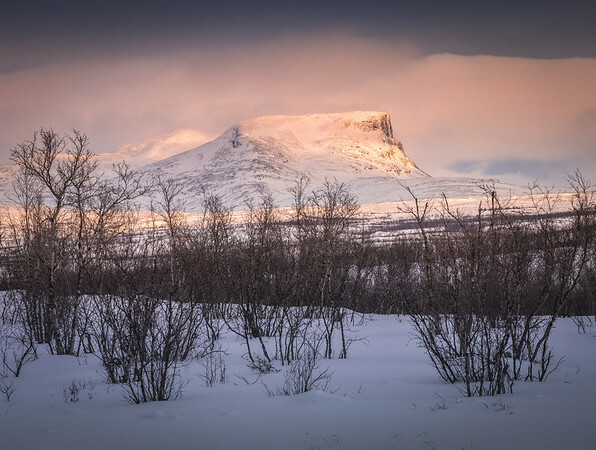 Shot during our snow mobile trip through the Abisko National Park. We came to a frozen lake. The lake was gigantic creating this huge plane white opening surrounded by forests and snowy mountains on all sides. Thanks @instasurs for braving the knee deep snow to pose for this shot. I used her footsteps as a leading line to add some interest and scale.